(a) Apply a total of 0.1 to 0.3g (0.00353 to 0.0105 oz.) of Toyota Body Grease W to the 8 areas shown in the illustration. 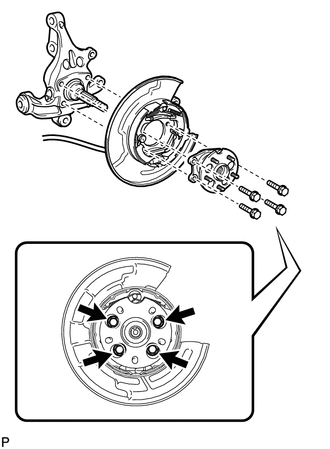 (b) Align the matchmarks on the rear drive shaft assembly and the rear axle hub and bearing assembly. Do not rotate the rear drive shaft. 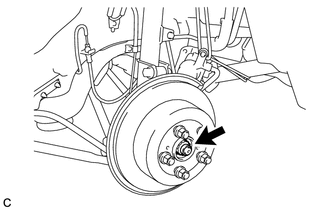 (c) Install the parking brake assembly and the rear axle hub and bearing assembly with the 4 bolts. Do not twist the parking brake cable assembly when installing it. (a) Clean the threaded parts on the rear drive shaft assembly and a new rear axle shaft nut using a non-residue solvent. Be sure to perform this work for a new rear drive shaft assembly. 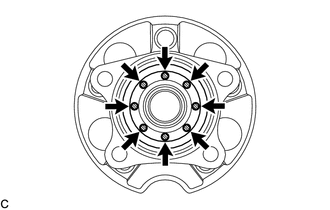 (b) install the rear disc with the 5 hub nuts. 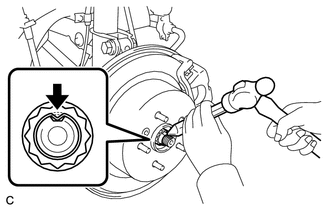 (c) While applying the parking brakes, temporarily install the new rear axle shaft nut. Stake the nut after inspecting for looseness and runout in the following steps. 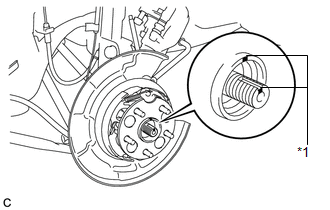 (d) Remove the 5 hub nuts and the rear disc. 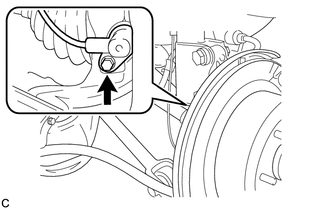 (a) Install the rear speed sensor to the rear axle carrier sub-assembly with the bolt. Keep the rear speed sensor tip and sensor installation hole free of foreign matter. (a) Using a chisel and a hammer, stake the rear axle shaft nut.